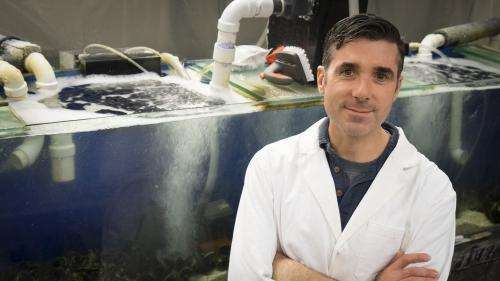 A Purdue University chemist has developed an adhesive technology that could help bond items in wet, moist conditions such as human tissue or underwater construction - by studying mussels and oysters. Jonathan Wilker, professor of chemistry and materials engineering, developed the adhesive while studying the environmentally friendly adhesive qualities of mussels and other shellfish. Wilker's patented adhesive is comprised of similar components used by mussels in their natural adhesives. "A lot of the chemistry involved in the animals' adhesive is protein-based, but no one is going to be able to make a complicated protein for large-scale applications. So we are substituting simple polymers for the proteins while maintaining other aspects of the adhesive chemistry," he said. "We have looked at the design and synthesis changes that we can make and compared our adhesive to what the shellfish are making. The system can be easy to generate on large scales and yet still maintain the functions that we are after. This synthetic mimic approach then allows us to tailor the material for specific bonding situations and applications." Conventional adhesives currently available are made from petroleum feedstocks and can release volatile organic compounds and other toxic materials into the environment. Wilker's technology can be developed from renewable resources. Wilker and his team have created a platform technology that industry partners could develop in several ways. "We can design certain characteristics into the adhesive, but we won't be able to focus on a specific product for a specific application," he said. "It's possible that we could connect with different companies that can develop the materials for several sectors including aeronautical or automotive manufacturing, biomedical joining of tissues, construction, coatings and cosmetics." Biocompatible, waterproof, self-healing, and reversible: A new adhesive for medical applications?